ISLAMABAD: The government will issue 100,000 commemorative coins worth Rs 20/- on Saturday (today) on the occasion of ‘150 Years of Celebrations of Lawrence College, Ghora Gali, Murree’. According to a statement issued here on Friday, the coin will be available for the public at all field offices of the State Bank of Pakistan (SBP) from May 28. The coin consists of 75 per cent cupro-nickel and 25 per cent nickel. The coin will be round with serration on the edge and a diametre of 30 millimetres, weighing 9.5 grams. 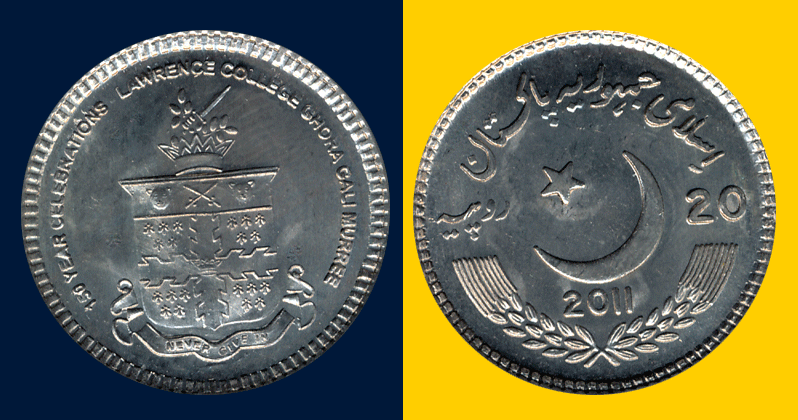 On the reverse side of the coin, a monogram of Lawrence College, Ghora Gali, Murree is depicted right in the centre. 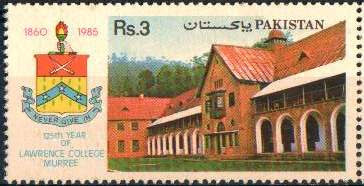 The wording ‘150 Year Celebrations – Lawrence College Ghora Gali Murree’ is inscribed in English on top of the coin along with the periphery. There are small beads all along the edge of coin. 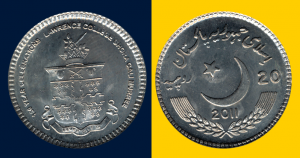 KARACHI, May 28: To commemorate the 150th year of the Lawrence College Ghora Gali, Murree, the State Bank of Pakistan launched Rs 20/- commemorative coins on Saturday. The coins went on sale at the exchange counters of all the 16 field offices of the SBP Banking Services Corporation. In the span of one week, it’s the second Rs 20/- commemorative coin that the SBP has introduced — the first was issued to celebrate the 60 years of the establishment of Pak-China diplomatic ties. The heads, or obverse side of the coin, has the expanding crescent and a five-point star in the centre, signifying Pakistan’s flag. Islami Jamhooria Pakistan inscribed in Urdu can be seen over the crescent, below which the year 2011 is given. The number 20 in bold letters as well as in Urdu flank the star. A circle of beads along the rim of the coin adds a decorative element to it. 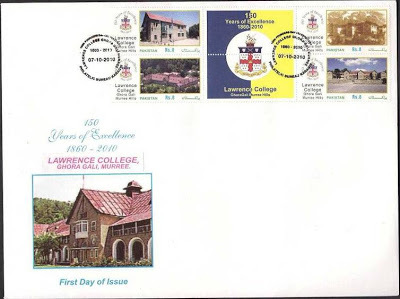 The monogram of the Lawrence College is shown on the tails, or reverse side, of the currency coin. Along the periphery ‘150 Year Celebrations — Lawrence College Ghora Gali Murree’ can be read in English. The coin is composed of copper (75 per cent) and nickel (25pc). Its diameter is 30mm and it weighs 9.5 grams. 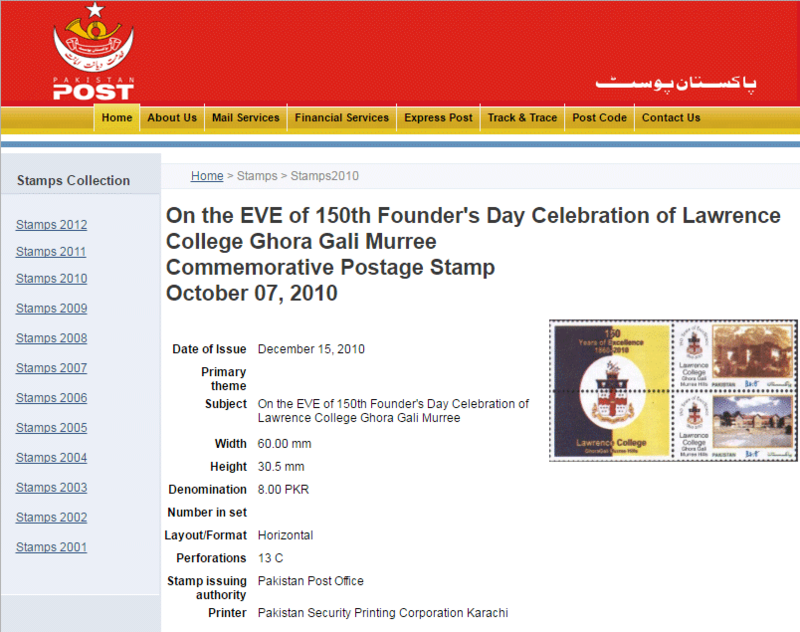 KARACHI Oct 6 The Pakistan Post will issue a set of four commemorative postage stamps of Rs 8/- denomination each on the eve of 150th founder’s day celebration of Lawrence College, Ghora Gali, Murree Hills, on Wednesday. 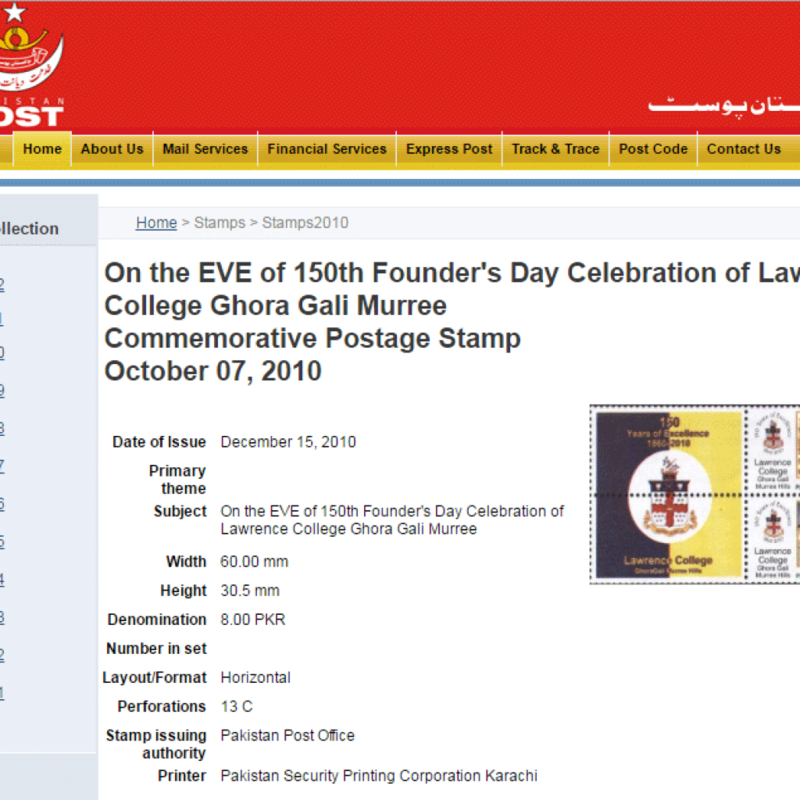 Designed by Gibran Ali Syed, the stamp has been printed at the Pakistan Security Printing Corporation and will be made available at post offices from Wednesday, says a press release.